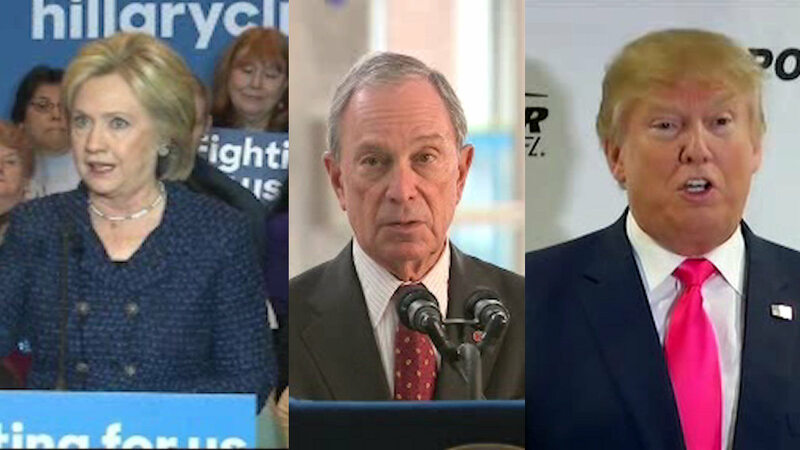 WASHINGTON -- With only a week to go before the first votes of the 2016 presidential race, Republicans on Sunday waved around endorsements from others and dismissed former New York Mayor Michael Bloomberg as a potential third-party threat. Democrats, who could be hurt most by a Bloomberg candidacy, didn't shrug off the prospect. Vermont Sen. Bernie Sanders, who is surging against former Secretary of State Hillary Clinton in early states, urged Bloomberg to "bring it on." Clinton acknowledged that Bloomberg had gotten her attention - but suggested the threat could be irrelevant. "The way I read what he said is if I didn't get the nomination, he might consider (running)," she said on NBC's "Meet the Press. "Well, I'm going to relieve him of that and get the nomination so he doesn't have to (run)." The comments came as Republicans chose sides among their candidates and billionaire businessman Donald Trump and Texas Sen. Ted Cruz battled for primacy in the nation's first contest in Iowa. Slowly, establishment Republicans were heading in Trump's direction largely because he's not the combative Cruz. And Cruz was showing off his marquee endorsement from Rep. Steve King, who is influential with the most conservative Iowans. Trump on Sunday dropped another name as he played defense against charges that he's only been a conservative for a few years. "I am a conservative," Trump, endorsed this week by 2008 vice-presidential candidate Sarah Palin, said on NBC. "And what I say to people is this: Ronald Reagan. He was a somewhat liberal Democrat, and over the years, he evolved and he became fairly conservative. Not overly, a fairly conservative Republican." A televised spat ensued over who's a conservative. "Donald Trump is not a conservative, and you need a conservative to lead the conservative party into the general election," two-time Florida Gov. Jeb Bush said on ABC's "This Week, touting his endorsement by former Senate Majority Leader Bob Dole. Cruz, meanwhile, said Trump has not been conservative for long, and pointed out that he was for social causes like gay rights at some point in his life. "They are not Iowa values," Cruz said on Mediabuzz.